IMBB #14: Orange You Hungry? Combine the apricots, cardamom, orange juice and water in a saucepan and bring to a simmer over medium heat. Cook, shaking the pan instead of stirring, for 25-30 minutes, or until the apricots are swollen and plump and the liquid is greatly reduced. Add the honey and continue to cook until the liquid bubbles thickly, about 10 more minutes. Remove from the heat and let cool. Meanwhile, pour the cream into a pot and sprinkle the gelatin over the top. Allow it to soften for about 10 minutes, then add the sugar and heat on medium until both the gelatin and the sugar have dissolved. Remove from the heat, stir in the buttermilk and the rosewater, and pour into 6 oiled small bowls or ramekins. Put these in the fridge and allow to chill until completely set, about 3 hours. 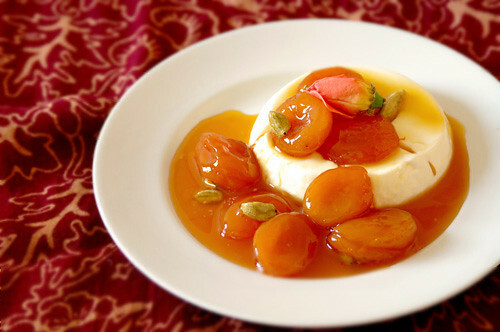 To serve, unmold a panna cotta onto a plate, coaxing it with a spoon if it stubbornly refuses, and spoon some room-temperature apricots and honey over the top. You can either remove the cardamom pods or leave them in for visual appeal. Although this is very sweet and creamy, something about the tanginess of the buttermilk and fruit leaves you feeling quite refreshed, so it would be a good dessert to end a heavy meal. Me, of course, I’ve been eating it for breakfast, lunch and dinner! Note: I think this would take very well to alterations. You could no doubt substitute another spice like ginger or cinnamon for the cardamom, apricot nectar for the orange juice, yogurt for the buttermilk, vanilla for the rosewater, splenda for the sugar… you get the picture. This sounds delicious and your photo really, really rocks! Melissa – I hope that tastes even half as good as it looks. This sounds like a truly delightful combination! Hi Melissa!Mouth watering indeed – I’d love to take spoon and take a bite! I definetly see how ginger could fit in, but with Cardamom…I find it hard to top. I could >sit in< Cardamom all day, have it in tea, dessert and a spicy indian dish. 🙂 Very yummy looking. I am so glad you chose the panna cotta. I almost did one for SHF but just completely ran out of time. The buttermilk & rosewater sounds so good! Then with the addition of the stewed apricots! Wow it is an irresistable dish! That looks incredible! I know I’m not really a vegetarian any more, but is there a good vegetarian alternative to gelatine?Btw, I noticed that someone left a comment about elephant brand soft drinks after your irn bru post. If you ever go to Sri Lanka I recommend necto and nelly crush. I haven’t had either for years but as a kid I would guzzle as much as possible whenever we were in Colombo. Hi Lil, thanks for stopping by! I have heard that agar-agar gives a softer jell, but I haven’t actually tried using it myself. Good luck with your French exam and I hope the pannacotta turns out well!